/ Modified apr 18, 2017 5:31 p.m.
Members of the Arizona Corporation Commission at their Tucson hearing room, Feb. 8, 2017. 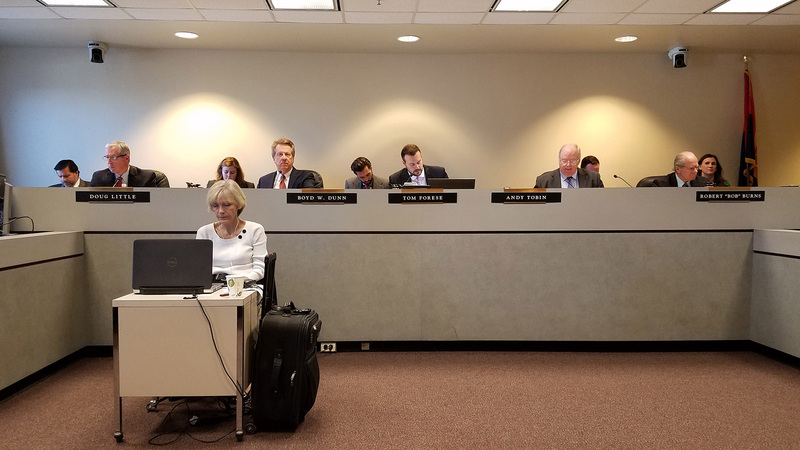 The Arizona Corporation Commission Wednesday night approved a rate increase and changed rate structure for Tucson Electric Power Co. The average TEP residential customer's bill will go up $8.74 in the summer, and a penny less in the winter under the rate plan. The rates are expected to increase TEP's revenues by $81.5 million annually. The commission also approved two electric rate plans, giving the utility a total of four options for residential users: a traditional plan, a peak-demand plan, a time-of-use plan and a demand time-of-use plan. The increased rates will come primarily in the form of high usage fees. The company will charge a $10 service charge for time-of-use customers and $13 for the standard plan. The current service charge is $10. TEP had asked for the fee to increase to $20, but later changed the request to $15. A consumer advocate said keeping the fee down was a victory. “That was important to us because that keeps more of the bill in the control of the customer, and less of it being forced through a fixed fee that before they even turn on a light bulb they’re already paying,” said Jeff Schlegel of the Southwest Energy Efficiency Project. Barrios said new rates and rate plans should be in place by March 1. More changes could be coming to TEP customers who use rooftop solar panels. The rate that TEP pays for excess electricity from such panels is the topic of another Corporation Commission hearing scheduled for late June.